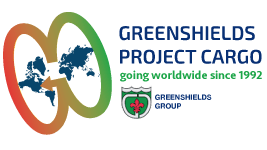 Greenshields Project Cargo e Move One offer services for logistic and clearance in Kuwait. Imports to Kuwait from the U.S. require three certified and legalized copies of the commercial invoice, three copies of the bill of lading, and a certificate of origin. be duly certified by a U.S. Chamber of Commerce or the National U.S.-Arab Chamber of Commerce. Legalization is done by the Kuwait Consulate in New York City, or by the Kuwait Embassy in Washington, D.C.
Indicate the country of origin. Invoices and documents should be available to the importer before the arrival of goods in Kuwait, as goods cannot be cleared through customs without these documents. All FCL / LCL shipments, IMPORT/EXPORT cargo must be palletized. Customs will issue a penalty fee of KD 80 to the customer directly and additional service charges are subject to apply. Do You Want to Ship Your Cargo to Kuwait? Contact Us.